Recently I’ve been targeting some old servers for virtualization. Getting rid of these old, slow, power sucking, rack hogging servers should be in my job description… worded just like that. Only thing keeping these dinosaurs around is software that the developers have decided was so unique and expensive that they require USB dongles to prevent us from posting their software on the internwebs for all to download and install. Software like, CNC machining and CAD drafting licensing servers. No only do these license servers require a stupid USB dongle – they also call home to check in. Redundancy? You bet. Do they care? Not that I can determine. License servers are nice and very handy in an educational environment where the software can be installed in many rooms – but only scheduled to be used in one room. The software on the desktops check out a license when launched and won’t run if there are no more left. So when I want to virtualize a server like this – I can’t because virtual servers don’t have USB ports. No USB port, no USB dongle to authorize the license server. No license server, no desktop software will run. Luckily there is a fix – USB Concentrators. A USB concentrator is simply a box with USB ports on one side, a network port on the other, and some fancy software in between and on the virtual machine itself. With a bit of software and a pinch of luck, your VM will have a true, i’m touching reality, USB port. We have a few of these damn USB dongles for various software, so I was able to justify the 14 port Digi AnywhereUSB concentrator. Our EDU price weighed in at about $1,400. Yep, a C-note per port – thank you software DRM. Luckily they now are routable – so one concentrator can support servers in multiple locations. They make smaller ones, but the cost per port is higher and we’d need two of them – which brought us within a few hundred bucks of going for the 14 port. One of our license servers, GibbsCam, decided it wasn’t going to work with our Digi AnywhereUSB ports. 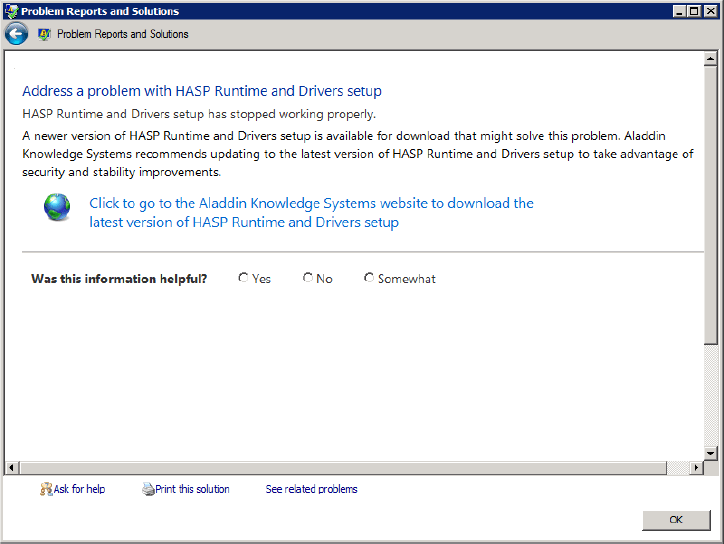 After a few reboots and reinstalls, Windows actually kicked off a “Problem Report and Solutions” report that explained that a service called HASP had gone over the deep end and after checking with Microsoft – a fix was recommended. Insert shocked emoticon here, because that’s a first that this service has actually provided usable information – and insert a second shocked emoticon for software that I wouldn’t consider commonplace is actually tracked by this. A couple of clicks later, I’m staring at a new web page hosted by esafe.com, specifically this one. After downloading and installing the HASP update, our USB dongle was recognized and we could continue on with the heavily DRM’ed license server – in a virtual environment. This is not a knock on GibbsCam support, they actually do rock. To complete our install they had to “adjust or reset” some settings on their end. But they returned their calls quickly and we’re professional about it. I’m more upset about the layers of DRM used by them to prevent piracy or non-compliance of their software. I’m also upset with the fact that companies that have to deploy hardware to support this crap when a very viable solution is already available that doesn’t require hardware. The end of the story really is this: If you’re going to be paranoid about someone stealing your software, just have the software phone home -or- require a hardware key. Neither will prevent all piracy, but the problems with requiring hardware is archaic and an assumption that your customers are running hardware to support it. It’ll take us about 2 years to recoup the cost of the USB concentrator… a waste of money that could have been put towards more software licenses or things that would actually help students like workstations and teachers – if these dongles didn’t exist. This entry was posted in VMware, Windows. Bookmark the permalink.